We appreciate that creating a new website for your business can be a daunting prospect so we break it into manageable stages. You can be involved as much or as little as you like at each stage - each stage after the first that is. We need you to tell us about your business before we can do anything. Who are your clients or, perhaps more importantly, who would you like to be your clients? Where do you see yourself in your marketplace? Are you exclusive, selling on quality and service, or are you fighting it out on price for volume business? Do you want to work within your existing branding or colour scheme, or start from scratch? Sometimes existing branding makes our job easier but sometimes it's... er... a challenge! 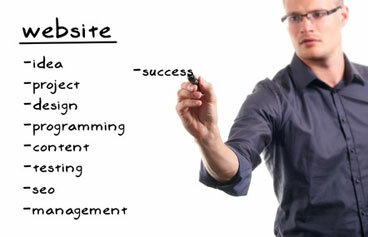 We'll mock-up some website design ideas to discuss with you and between us, we'll agree a design to take forward. This is where art meets tech and we turn your chosen design into a responsive, content-managed, search-engine-friendly website. Then we start to fill in the spaces in the plan we created earlier. Some of our clients like to give us finished copy for their website while others prefer to chat while we make notes or record. We can use your photographs, or images from your suppliers, or take some new photographs - we have our own in-house pro photographer. As the site nears completion we'll invite you in for some hands on training so you know how to make changes to your site and keep it up to date. When we've finished, and you're happy, we publish the website and submit it to the search engines. Our work doesn't stop when your website is launched. We'll monitor your website's performance to make sure the search engines find it and help you fine tune your search terms. This is also the time to start any off-page search engine work - arranging links from other websites and promoting the site in the social networks. If you're a prolific tweeter or Facebook addict this will come naturally but if not we can help you get started.